Hi Friends: I have been away for a destination wedding & helping my daughter move. It's good to get back to a bit of creativity. Here's a quick tag for the SSS challenges this past week. 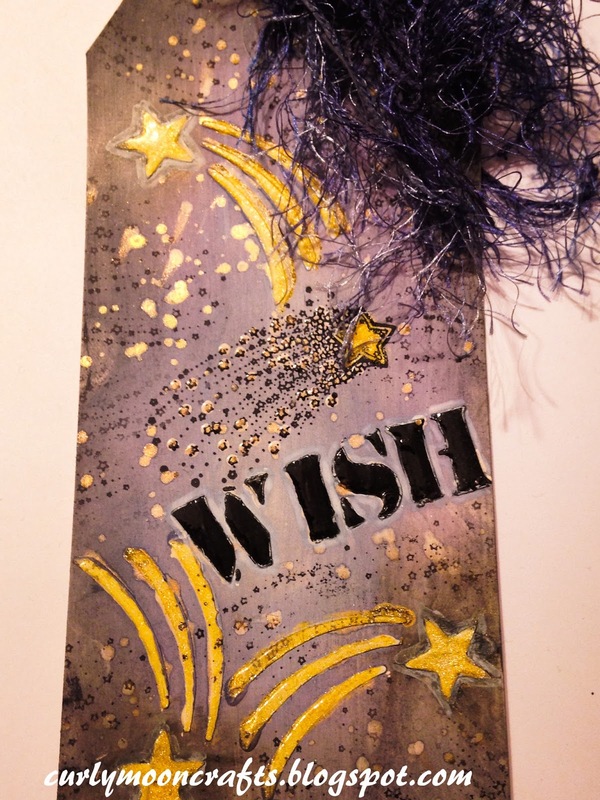 I used both white and black modeling paste with stencils for the stars and wish sentiment. I stamped a shooting star image with Jet Black Archival ink. Then I covered the shooting stars with Gold Viva Decor 3-D Stamp Paint and Distress Paper Mosaic Glaze to create a resist. I used the glaze on the Wish word to make it glossy. Then I used Distress Inks to color the background (Black Soot, Stormy Sky, Chipped Saphire, and Dusty Concord). I splattered some Gold Shimmer sprays over the background, then finished the tag with some coordinating fiber yarns. Thanks for taking a peek. Happy Memorial Day! hello Patti! super cool tag...nice background! I am so glad you played along with us at simon says stamp wednesday challenge!